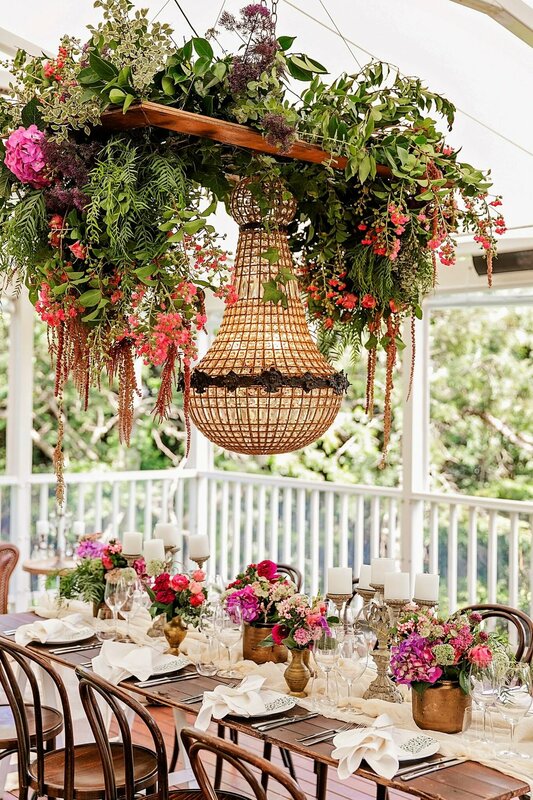 She is undeniably the greatest wedding floral designer on the Sunshine Coast (if not the entirety of Queensland), and it's no surprise, considering Terrianne of Mondo Floral Designs has immersed herself in the world of flowers since the age of 17. Fast forward, and now Terrianne and her team at Mondo Floral Designs pride themselves on creating the most inspirational and visually impressive wedding floral designs right across the region. This week Mr Theodore was honoured to have a little chat with Terrianne, the creative genius behind Mondo Floral Designs. She tells us how she started in the world of flowers and what is so unique and personal about the Mondo Floral Designs approach to wedding flowers. Why did you start Mondo Floral Designs? After 14 years in business in Brisbane city, I decided that I had tired of retail and corporate floristry. While I was always doing weddings during this time, it could never be my sole focus. Weddings were just part of what we did, amongst all the other facets of owning a retail florist, however I wanted weddings to be my everything. I really yearned to get away from Brisbane and I had spent some time in Maleny on rare days off and decided it was a wonderful place to live, but I was also acutely aware of the appeal of weddings not only in the Hinterland, but all over the coast. I decided to sell my businesses in Brisbane and start planning my next venture – Mondo Floral Designs, where I was able to solely concentrate on what I truly loved - creating wedding floral designs in an area that was just so inspiring. I wanted to bring my experience and background to an area that I felt was about to flourish, and I knew that the amazing locations here on the Sunshine Coast would only attract more and more couples wanting to celebrate their wedding day in this beautiful region. So while it was a personal choice to make a life change, my major life decisions are often based around business, (that’s what happens I guess when you start out at 18! ), and I could see a new exciting journey with a new business, and it has turned out to the most rewarding decision personally and professionally. How long have you been creating magical flowers for? After completing year 12, I started studying and needed to get a part-time job. I applied for a job as a junior florist at the age of 17 and I was lucky enough to get the position in a busy Brisbane city florist. Six months after starting my job (much to my parents concern and may I say disgust! ), I fell in love, not with a handsome potential partner, but with floristry, and I decided to stop studying and put my focus and passion into learning floral design. Eighteen months later, at the tender age of eighteen and a half, I was given the opportunity to buy the business I was working in, which I committed to, and, as they say, the rest is history! It was the beginning of my career not only as a floral designer, but as a business owner, and I continued with a drive and crazy enthusiasm that seemed to just inspire me to grow and one I know has now given me the skills and experience in not only floral design but business, and ultimately life!. By the age of 25, I had three shops, two inner city florists and one suburban floral studio. While all my friends were venturing overseas on exciting holidays, having romantic relationships and exploring the world, I was living and breathing flowers and learning how to manage this crazy business of blooms! What unique approach is Mondo known for, what sets you apart? I like to think that we set the trends, not follow them. My team and I are always wanting to broaden the boundaries, stretch the creative limits, and inspire and create unforgettable floral statements. Weddings are all we do, we live, breathe and sometimes sleep (dream) weddings, weddings are our everything. We aren’t balancing every day floral retail commitments with weddings, so this way we can solely focus on the wedding day itself. What’s your most favourite thing about weddings? For me, it’s the whole journey; meeting clients, hearing their story, creating and building a concept that reflects their vision. And then of course, delivering that concept. We cater for weddings of all sizes, large and small, and every client receives the same attention, they get our everything. It’s a very personal and intimate process, and we are humbled to be chosen for such a memorable occasion. What can couples expect from you? Professionalism - Experience - Creativity – and our everything! If blooms are a priority for you, we are your go to gang, it’s not something we take for granted, it’s a pledge that is very close to our hearts. We don’t compromise on anything, we hope that shows within our reputation and our catalogue of work. How long before the wedding should a couple start looking for a florist? I always suggest that you need to pick your ‘A’ team as soon as possible. Many of our clients book us in 12-24 months in advance, while weddings are all we do, we are limited to the amount we can take each day. My suggestion is when you have a good idea of a style, colour palette and floral vision it’s time to start talking blooms! Where can couples find you? We are in Maleny – in the Sunshine Coast Hinterland – we operate out of a charming cottage, it’s filled with incredible inspiration and a beautiful vessel collection. We cater to all Sunshine Coast locations and afar, however, meetings are always scheduled by appointment in our studio. This is a great way to be inspired! Many of our clients live interstate and sometimes overseas so we also offer wonderful platforms for digital communication that allow us to connect with them easily. How far from your home base do you travel for weddings? We do weddings everywhere. We certainly cater for weddings outside of the Sunshine Coast area, the majority of our weddings however are on the Sunshine Coast, from the Hinterland regions to the coastline, and everywhere in between. On a more personal level, what’s your goal for 2019? Hoping to start smelling the roses, as well as working with them! I am excited to hopefully schedule in a little bit of R and R at times during our current year, it’s important to start building a little work life balance when our schedule allows us to do so. It can be challenging in such a labour intensive consuming industry where we sometimes work 100 + hours a week, but I have an amazing team of creative designers to take the reins, and it’s necessary to be able to re-charge the creative batteries. And finally, anything unique coming to 2019? In terms of flower trends, colour palettes etc. Oh the trends for 2019 and beyond are so exciting, a real direction to more architectural bloom designs, scaling back on the Bohemian and directing our creative vision to sleek and contemporary designs with plenty of attitude! The huge changes in colour palettes and extensions of imported premium blooms are really increasing our ability to make the designs more interesting. The big scoop from me for the future – HUGE ceremony concepts, the wow is about to step up a level or two around the space where our clients say ‘I Do’ we can’t wait – the Sunshine Coast focuses on outdoor ceremony spaces, the diverse landscape allows us to create unique options for each individual space which is super exciting! Get in touch with Terrianne and the team at Mondo Floral Designs and see how they can turn your floral vision into a reality.